Reinterpretation of ancient myths and legends from Greco-Roman writings have inspired countless modern bestsellers across various platforms in the last few decades. For example, The Percy Jackson series of books and movies, Thor movies, adaptations telling the legend of Troy… Considering the much wider and deeper range of stories available in Indian mythology, it is hardly surprising that books belonging to mythological fiction/adventure genre have been among the most popular when you look at Indian bestseller charts. Being avid readers of Indian mythology, we also like to explore various versions of it including modern takes and so we are constantly searching for new authors. And so when we came across the Kalki series by a very young and well liked author called Kevin Missal, we started reading it without losing any time :). This book has been provided to us by Fingerprint Publication for our unbiased reviews, and for team ThinkerViews I had a chance to read it and share my thoughts on it. Book 1 in the series is called Dharmyoddha Kalki – Avatar of Vishnu. 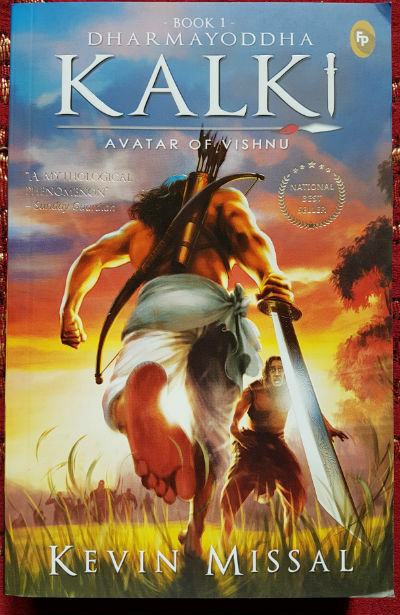 The cover page is very attractive and uses a lot of bright colours to create an eye-catching visual of a man in white dhoti and angvastram running towards another man. The hero carries a shining sword and a bow and quiver of arrows slung across his powerful back. The prologue tells us about the destination, so we’ll talk about the journey first as it takes place through two parts: The Battle of Shambala and The Rise of Kali. The story starts with us meeting Kali, a charismatic, diplomatic leader who is trying to bring peace and lasting truce amongst the Manavs who rule Illavarti and the Tribals who are scattered around them. The Tribals include united tribes like Yakshas, Rakshasas and Nagas mainly but also freely wandering Mlecchas and almost extinct Asuras. There is also mention of southern tribes called the Dakshinis. As long as the memories go in these times, there was a Mahayudh and a Breaking after which the trinity of Brahma, Vishnu and Shiva recreated an orderly world. The priests in this world gave more importance to Manavs and side-lined the Tribals, leading to continual warfare among the peoples. 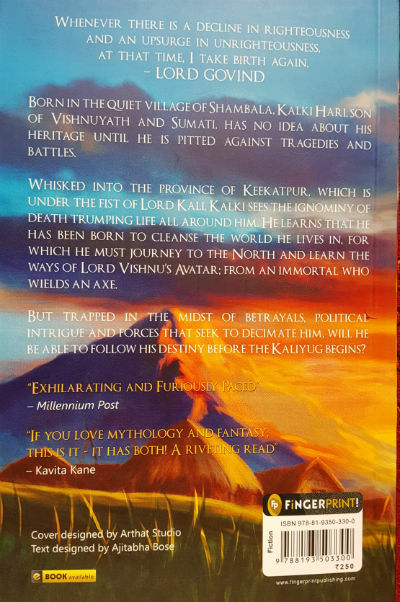 Kali has forged an alliance of these tribals by sheer willpower and intelligence and with some manipulation he wins over the king of Illavarti – Vedanta. This leads to Vedanta becoming a puppet king being ruled by a council including Kali, Vasuki (King of Nagas), Kuvera (Chief of Yakshas) and Raktapa (Leader of Rakshasas). All these people come to reside in Indragarh and the pieces on the chessboard start to move. Essentially, all tribal chiefs hate other tribes, so they are all conspiring to murder one another using spies and assassins. When one Naga assassin plunges a dagger into Kali bringing him on the doorstep of death, his sister Durukti is told about a mythical substance – Somas. In the quest for this forbidden substance, Durukti leads a band of Rakshasas to the village of Shambala. It is time for Kalki to fight for his village and his people. Again. In a different track, we have already met Kalki as a good natured, supernaturally strong young man whose powers aren’t quite understood by anyone including himself. He has superhuman strength and ability to heal. He faces the first tragedy when Mlechhas destroy his farm, kidnap his father Vishnuyatha, torture his brother Arjan and in spite of all Kalki’s efforts Vishnuyatha dies. But his dying words point Kalki in direction of an ancient figure hiding amongst them disguised as a drunkard. This is Kripa. But before Kripa can teach Kalki much except the fact that Kalki is supposed to be the saviour of this age, the battle of Shambala happens with Dukruti and her Rakshas soldiers. And here Kalki loses his best friend Lakshmi, countless other innocent people of the village and is himself taken as a prisoner to Indragarh. The mystical Somas is given to Kali and he comes back to life – but with dire side effects turning him bald, black and mad. From a strategist and diplomat, he turns into an insane, dictatorial killer. He destroys the whole council making sure he becomes the King instead of Vedanta. He tries to execute Kalki publicly but that doesn’t go as planned. This only enrages Kali and he makes sure everyone who has sympathy with Kali is dead – including his friend Bala and his brother Arjan. So where is Kalki’s path going to take him now? Is he really alone and friendless or will he find allies – namely Kripa, Padma and a parrot called Shuko – that shift like sand at times? Great heroes need great villains and Dharma needs to defeat Adharma. Although the prophecy speaks of the Adharma rising and all pointers lead to Kali, the encounter between him and Kalki doesn’t give Kalki the feeling that Kali is the main adversary. So, who is the master puppeteer here? Is anything that has happened in Kalki’s life has happened by chance or is it all part of someone trying to manipulate destiny? When you try to tell a massive tale spread across multiple books, the canvas is of course very big and there is a multitude of characters, each trying to tell his / her story. It is through these characters that we join the dots to make the complete story. Kevin Missal has tried to do just that here and so instead of being just Kalki’s story and a narrative of events as they happen to him, we see glimpses of different events happening at different places. This also means that the characters have to emerge through how they behave during their time on screen and so sometimes they feel like figurines of clay in this book. Their form isn’t quite fixed yet and their actions sometimes appear disjointed or unlike their behaviour in the previous scene. There are some fundamental traits that remain but the thoughts and actions change to fit what is happening around them. This is also true of the landscape where conspiracies are ripe and alliances wear thin quickly and so the characters are forced to change their choices. The concept is quite interesting and it involves some characters from previous Avataras of Vishnu including Parshuram, Ram and Krishna. As you move forward in the book, you can see all pieces falling into place in accordance with some old myths and creating some new. The final chapter provides a crucial piece to the identities of some players, but Adharma is yet to appear I think. If you are well versed with Indian mythical tales, especially the Mahabharata, you can make a few conclusions and predictions of your own as the story progresses. We enjoyed the detailing of fighting sequences as the author tries to give us a detailed description of weapons and moves. There is a fair bit of violence in this brutal world, so we would not recommend this book for very young readers. 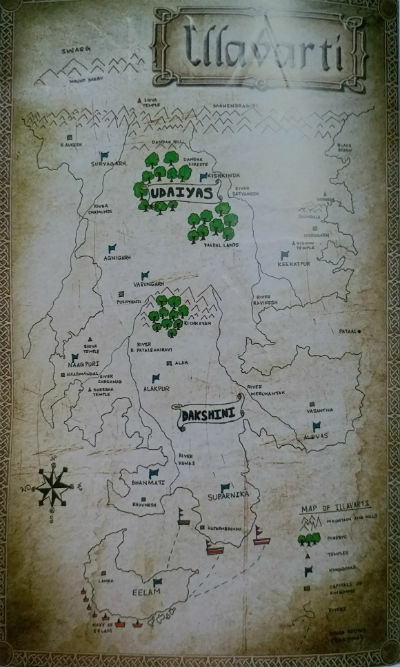 Back side of the front cover page provides an illustrated map of Illavarti indicating various villages and kingdoms mentioned in the story. We also liked the timeline provided at the beginning of the book. Its quite helpful in connecting references to old times. However, in the narrative of the book, there are a few instances where the time factor in the sequences is a bit off. For example, the journey from Indragarh to Shambala takes a few days there and back to obtain the Somas through the battle and yet later it is referred to as if it happened in a day. Why are they so wellg-uarded? The dialogues are funny, very modern in their tone and feel and will remind you of movies. Some of the opinions expressed by characters here dismiss the concept of afterlife and existence of Gods, proclaiming that they were all Manavs who did heroic deeds, thus providing a skeptical, questing element to the story. As usual, trying not to give the story away too much, we’ll share some inspirational quotes and thoughts from the book. These are plenty considering this is partly a journey of self – discovery for Kalki. When religion becomes a limitation rather than a place to grow or we put too much of our faith in the Gods, we set ourselves up only for disappointment. Tragedy is bad, but it makes you rise as a hero, because it gives you courage and a sense of reality. Strength in a person doesn’t define a hero. But where he uses his strength is what matters the most. Cowards give up after a defeat. But those who get up after the defeat are the real winners. A sentimental person is a dangerous entity. Anger forces us to spew venom, but one must never forget that the wounds from venom never heal. As you can see, Kevin Missal shows a few sparkling insights into how his characters think. It is nice to see a young writer taking a stab at creating such an intricate web involving ancient and yet modern characters.